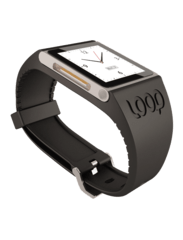 The Loop watch band is soft rubber and is very flexible. After removing it from the package, the first thing I did was try to insert the Nano. Where the watch face should be is an area carved out in the shape of the iPod with a slot about two-thirds of the way down. I tried to push the iPod’s clip in, but it was a tight fit. With a little pull on the rubber, the iPod slid in and clipped on. A groove in the back of the watch shaped like the clip gave it a place to lock in to and securely hold the iPod Nano in place. When putting on the watch, the first thing I noticed was how flush the clip was in the band, so it did not rub against my wrist. The ten holes in the band give plenty of size options and can go from very small to very large wrists. The soft rubber band fit fairly comfortably and let it fit snug without being too tight because of the band’s ability to stretch. After wearing it for a few days, the rubber molded to a comfortable position on my wrist and continues to fit well. The sides of the watch are open for easy access to the buttons and slots. Easy access for headphones, charging and interacting with the iPod for listening to assorted audio. It is a bit awkward to be walking or running with a headphone wire running from wrist to ears, but that is more of an issue with trying to listen to an iPod on the wrist more than any flaw in the Loop’s design, and may be alleviated with a pair of wireless headphones. The Loop is a good, sporty watch band for the iPod Nano. It is soft, comfortable and makes it convenient to carry my iPod Nano everywhere I go.